"This isn't a great leap forward, but I think this is a helpful step," said Dr. Lee Shulman, chairman of the Association of Reproductive Health Professionals, an obstetrician-gynecologist at Northwestern Memorial Hospital and a professor at Northwestern University. "I think it is a better approach in the group of women who have a very high rate of unintended pregnancy, which is younger women," Shulman said. According to a number of studies, one-third to nearly one-half of women on birth control pills miss one or two per month, increasing their chances of pregnancy. With perfect use of combination pills, containing both estrogen and progestin, 0.1 percent of users become pregnant each year, compared with the 3 percent to 8 percent rate studies have found with typical use. Femcon Fe, which the company says is just as effective as standard pills, comes in the typical 28-day cycle, with 21 days of active pills and seven days of inactive or "reminder" pills. The "Fe" stands for the chemical symbol for iron, which is included in the dummy pills. A month's supply will sell for $44 wholesale, somewhat higher at pharmacies. Femcon Fe is simply a chewable version of the company's Ovcon 35, a birth control pill that has already been on the market for about three decades. Reichel said the company initially planned to start selling the chewable contraceptive under the same name and had begun to distribute samples to doctors in late September. But when the company realized the two versions would confuse patients and pharmacists, it postponed the launch and changed the name and trademark. The company said the package is convenient for women who want to carry it in a purse: a credit-card sized dispenser kept inside a velvet pouch, Reichel said. That can be a bit more discreet than the big, "dial packs" in which birth-control pills usually are sold. Women must drink 8 ounces of water with the tablet. Like other oral contraceptives, Femcon Fe does not protect against sexually transmitted diseases and carries an increased risk of blood clots, heart attack and stroke, particularly for female smokers over the age of 35. Femcon Fe arrives amid a flurry of new contraceptive methods in recent years aimed at improving effectiveness through convenience or shortening or eliminating periods altogether. The first continuous-use pill, Wyeth's Lybrel, is awaiting federal approval. Warner Chilcott, part of drugmaker Warner-Lambert Co. until it was acquired by Pfizer Inc. a decade ago, is best known for its Loestrin birth control pill, which shortens periods slightly. 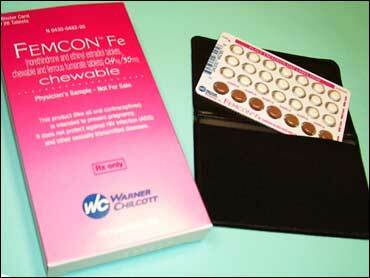 The tablets contain 35 micrograms of ethanol estradiol, the estrogen form standard in oral contraceptives. That's the highest level in the category of low-dose pills, and that dose could help women bothered by breakthrough bleeding, said Dr. Laurent Delli-Bovi, a Boston gynecologist serving as a paid consultant to Warner Chilcott. Femcon Fe also contains 40 micrograms of a second hormone, progestin, with a low enough dose that it could reduce progestin-related side effects such as bloating, depression, irritability and acne, she said. Shulman noted many generic birth control pills contain 35 micrograms of ethanol estradiol, but said any new method that helps the women take contraception faithfully "is a win for everybody." "I will, for sure, talk about this with patients," he said.